Yesterday ElComandante and me had a nice game together with Thorsten, who gave us helping hands with the 3.0 version of the Flames of War Rules. You need to know that learning rules is a matter of years for ElComandante and me. Therefore we now established a rules corner with big prints of the rule summaries, where you can think of your mistakes, if somebody sends you there. My first impressions of the rule system were very good. We had several situations where changed rules applied. I will now give you a short summary of what happened and why it felt intuitive and correct. We played the reworked cauldron mission, which saw changes in the setup area. The cauldron now is at one long table edge, which I like very much and the defender has delayed reserves. Since the attacker has reserves too, there is less material on the table at the beginning. As far as I remember the old cauldron saw incredible much stuff on the table at the beginning. The new setup was quite good for ElComandante since he had an entire maximum unit of Kartjushas across the Don, and an heavy mortar platoon (anybody happens to know if that is possible?). Since this leads to an devastating template ElComandante was initially lucky with the die result of the cauldron mission. Since I decided some seconds before we rolled the dice for a scenario that I will field tanks and not an Assault Pioneer Platoon I cursed some times. A minefield could have been helpful against a tank company. However I fielded a hungarian Gépkocsizó Század with 2 platoons infantry, 1 anti tank platoon, 1 weapons platoon, 1 Artillery platoon and 1 tank platoon. 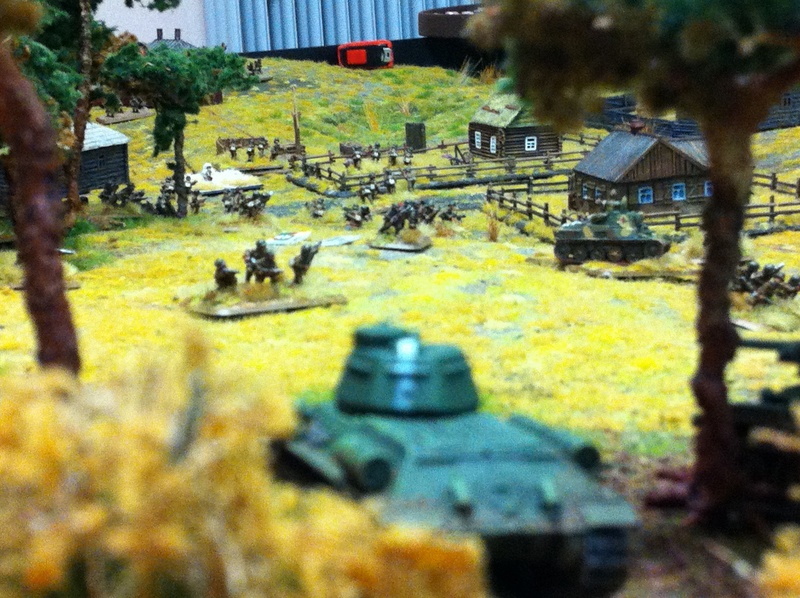 I decided to start in the cauldron with two infantry platoons and 1 antitank platoon in immediate ambush. I chose to use off board artillery as ElComandante did. I decided to act very defensive, which is the usual choice for infantry in a cauldron. 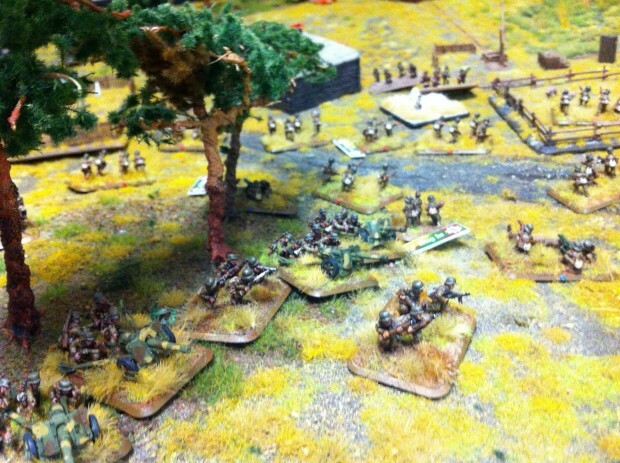 ElComandante attacked with infantry and tanks at my left flank. He rolled both units available at the start in the same segment. Now it came to the first changes in terms of rules. 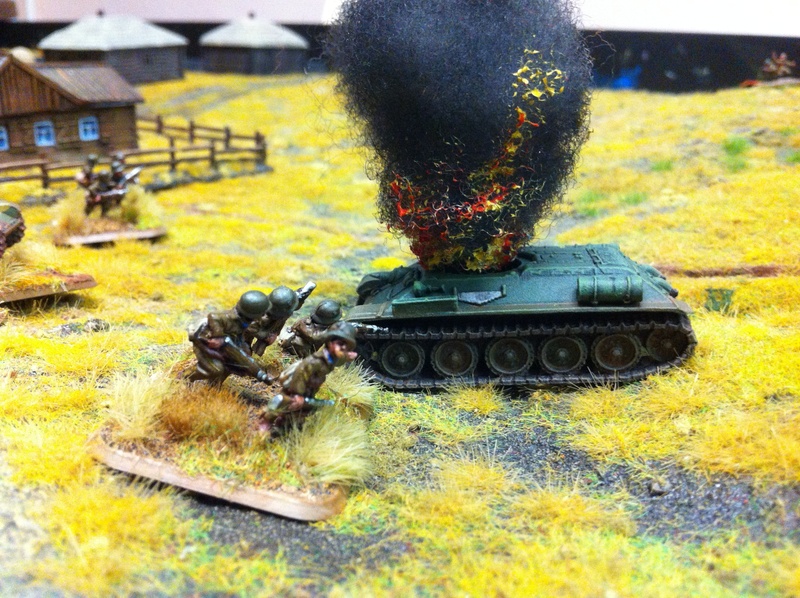 I was able to let my anti tank guns go to ground. If guns do not shoot or move they now have a 3+ save and are gone to ground. Therefore I could position the anti tank guns at the edge of a wood and I could wait, until the tanks attacked my infantry in close combat. Before that rule change it was possible to shoot down anti tank guns with tanks especially when the range of the tanks exceeded that one of the guns. Now it´s less easy for an attacker to get rid off the guns. Since there were enough options for my opponent to put pressure on my guns with artillery the change felt good. Now it is possible to have guns on the table if there is no ambush option. First sovjet assault on the hungarian positions. The next changes came to live when the first assault on my right flank with the first reinforcements took place. 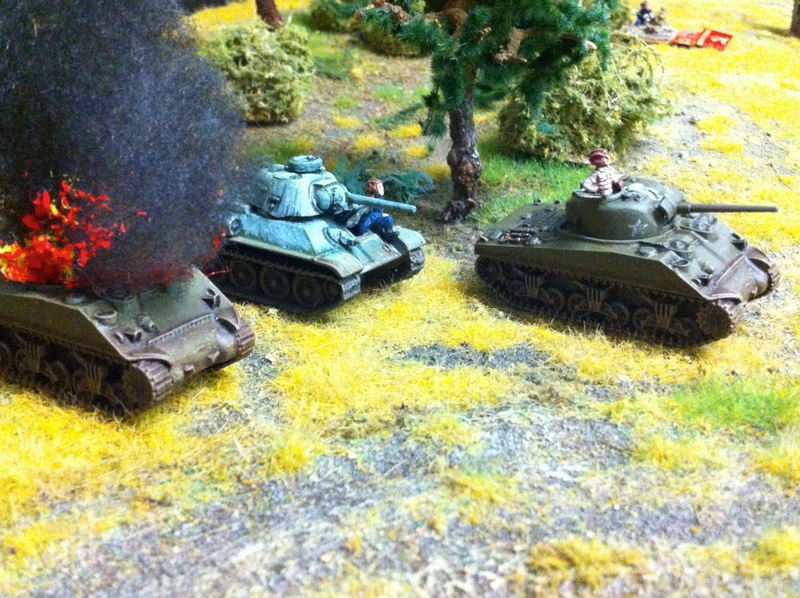 ElComandante attacked rather quickly with a T34 company. The new rules are very intuitive since only teams with enemies in 30cm distance may move into the assault, and only teams with enemies in 20cm may shoot defensive fire. Congratulations for these excellent changes. This reduces cheesy movements in FoW by 80% I think. 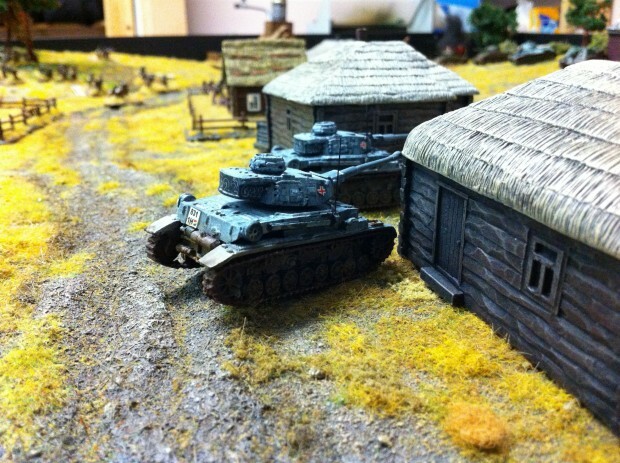 In our case the attacker´s dice where unwilling to win and the T-34 lost the first attempt, which was not very likely. One tank was bailed out, the company had not the morale to attack again and lost one vehicle in combat. On my left flank the infantry with lots of submachineguns rushed towards my positions. I have chosen to let my infantry fire with the help of two heavy machine guns attached from the weapons platoon. 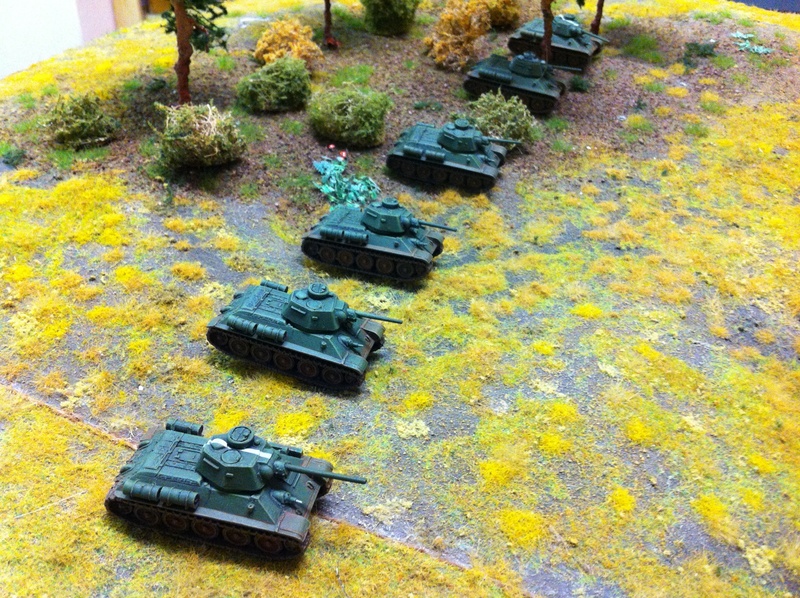 Since I faced only one infantry platoon I decided to change the position of the third machine gun. A rule change made that happen because not the whole second platoon was treated as having moved, only that specific gun team. 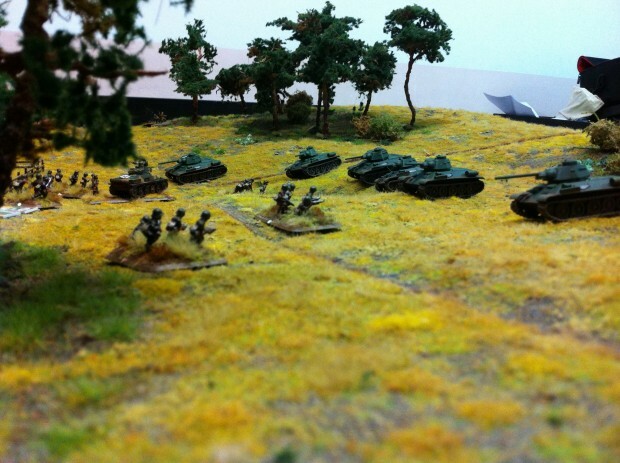 I moved this one in the woods and therefore had a entire infantry platoon gone to ground on my right flank. A very good change! 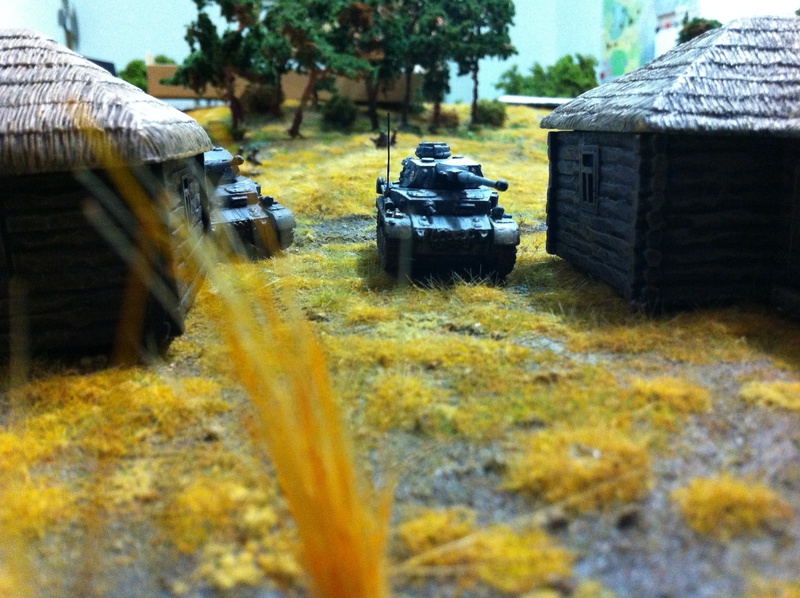 With a lucky shot from my artillery I was able to achieve an delay in the advance of the russian Sherman tank company. ElComandante had to reassign a company commander with his Bataillon commander, which draw some movement and diminished the amount of shots I had to suffer. At this flank the changed rules we used a lot were, that tanks may shoot over stationary infantry, which ElComandante used a lot. Same is for gun teams, which also applied, since there were two Maxim machine guns at that flank and a lot of tank rider infantry. In parallel ElComandante searched the decision on the right flank again. But he was not able to kill any infantry therefore I broke off. 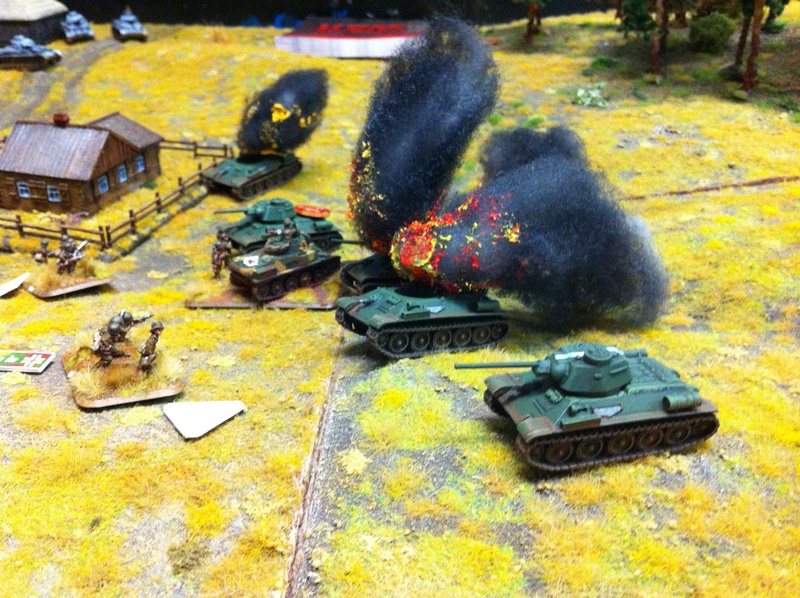 In my turn artillery shot a barrage on the tanks, after that I moved the guns through the woods and was able to take down another tank. The movement of light, medium and heavy guns has increased, which brings far more flexibility for infantry based armies. 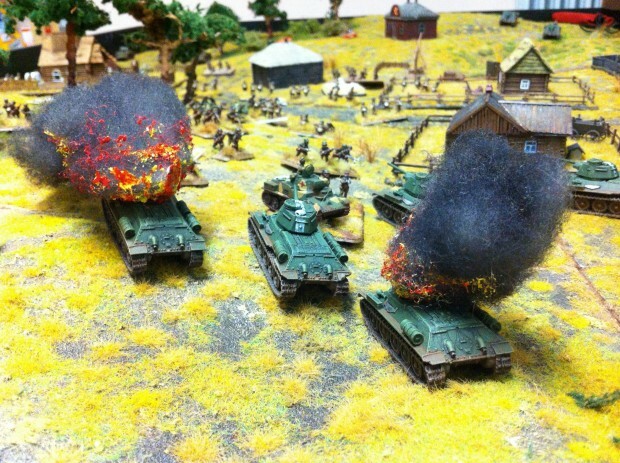 When fighting a russian infantry company or even more of them it might be very interesting, that the rule of mass only applies for teams that rush into assault. This means, you need to carefully move your russian infantry in an assault in order to have enough teams in action who count. It is a big difference for defending troops to pin down an assault by hitting 5 times or 15 times. It took me two rounds of shooting to get his infantry horde down to the interesting number, which was very important on my left flank. The modified hen and chick rule was appreciated since movement is now a bigger option for Soviets. They may shoot during movement of 30cm at +1. This is not brilliant since the Hungarians are veterans, but it feels better and leads to a more dynamic style of gaming. Although ElComandante was extremly unlucky that evening we both liked the new rules. The game was finally a major win for the defending Hungarians in the cauldron and ElComandante failed to use his advantage of 400 Points of tank support. In our campaign this victory for sure will be an important success. On the other hand I am very sure, that ElComandante will learn to combine infantry and tanks very soon. Having played Flames of war for quite a while I am very happy to say that once more the authors proofed to have an improvement in mind and not the optimisation of sales in another way but to have satisfied customers. Well done Battlefront! If you happen to read this article I am curious which is your new favourite rule change! 30cm gilt nur für die Russen (Quality of Quantity), sonst sind es auch 20cm. Dies ist aber m.E. definitv die beste Regeländerung. Auf dem zweiten Platz ist die Neuregelung der Independent Teams und der damit verbundene Upgrade des 2iC zum Warrior, der auch Company Morale Tests wiederholen darf. Kann man irgendwo im Netz auch den Zwischenstand der Kampagne bewundern? Strand, ich habe mir fast in die Hose gemacht wegen Deinem Avatar Pic! Danke für Deinen zweiten Favoriten, den kannte ich noch nicht. Die Kampagne wird von ElComandante in Form eines Kriegsberichterstatters als PDF geführt. Die kann ich gerne online stellen. Am besten schreibst Du ihn an, damit er Dich in den Verteiler aufnimmt.